Cosmopolitan Twarda 4 is Warsaw’s première luxury residential skyscraper, reaching an impressive 160 metres high and with 44 storeys. Designed by architect Helmut Jahn and developed by Tacit Investment, this 236-apartment structure has floor-to-ceiling windows throughout, providing panoramic views of the sprawling Polish capital. The building also has a commercial level on the ground floor, three floors of offices, and a recreation area at level 4 for residents. 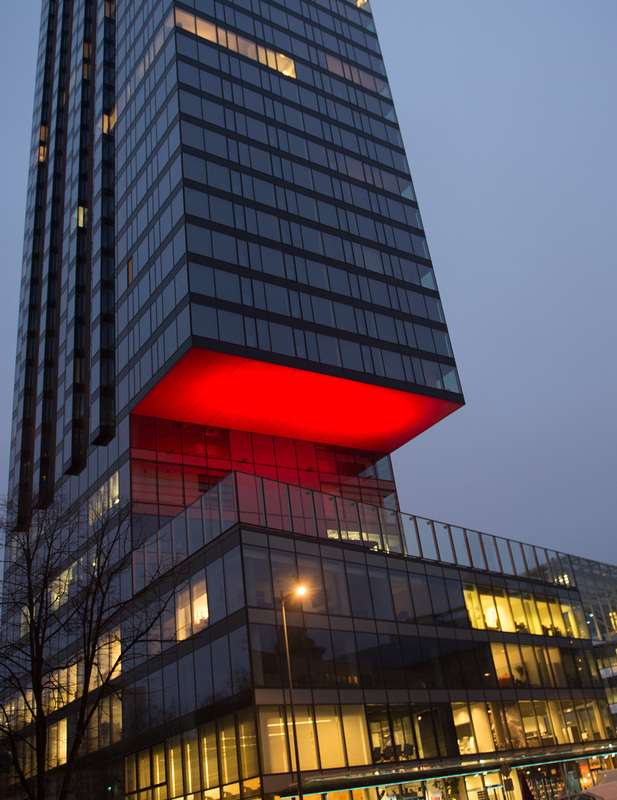 Jahn’s design of the tower included an illuminated red ceiling above level 4, providing an exciting area of visual intrigue both from street level and for residents enjoying the recreation area. This ceiling lighting had been attempted by another company in the past but needed revamping. The CEO of Cosmopolitan Tower approached Pulsar to assist with this ceiling illumination, as well as to provide eye-catching atrium lighting for the tower’s exterior. 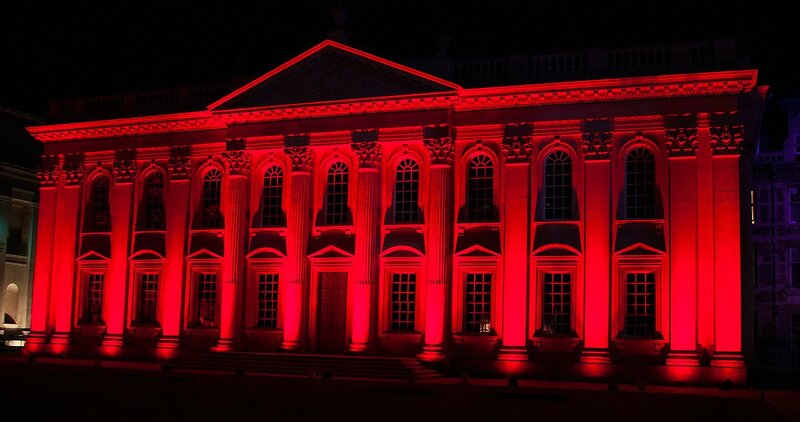 The previous company charged with completing the red lighting for the atrium had been a building company rather than lighting designers, meaning they lacked the specialist knowledge to get it right. The location, weak colour and incorrect beam angle of the existing atrium lights all contributed to an overall poorly-lit feature. Hot spots, poor colour rendition and high operating costs plagued the Cosmopolitan Twarda 4. 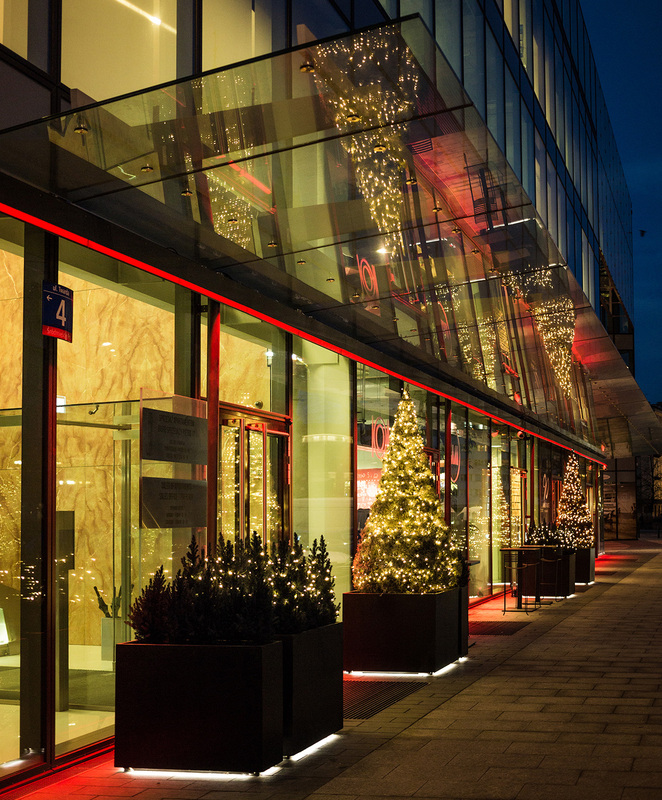 Pulsar provided a well-thought-out lighting scheme for the atrium which took into account desired effect, viewing angles (pedestrians and residents), operating costs and maintenance costs. Our solution was using 8 LED stage lighting ChromaFlood100R fixtures, discreetly mounted so as to be invisible to viewers yet provide consistent illumination. 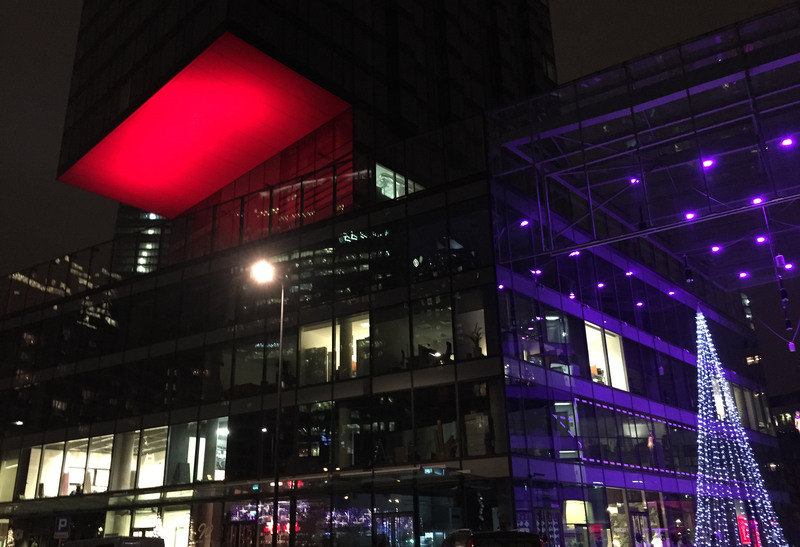 To create the tower’s eye-catching exterior atrium lighting, we used 12 RGB LED flood lights in the form of our ChromaFlood 200s to provide lighting with infinite colour capabilities. Pulsar also integrated ChromaAR111TC dimmable LED downlights into the sculpture “You and I” by artist Eran Shakine, another highlight feature of the Cosmopolitan Twarda 4 building. 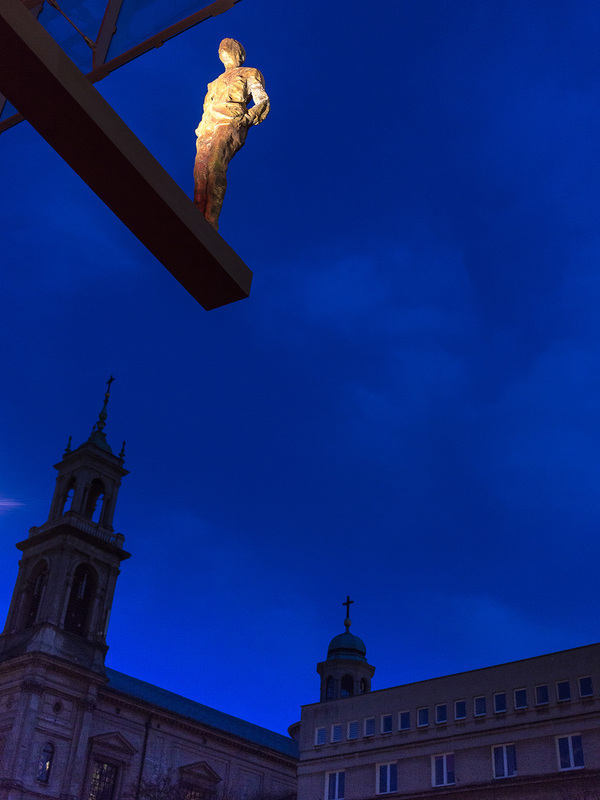 The whole system is controlled by Pulsar’s own architectural-grade lighting control system. Using our OutStation1 DMX Controller combined with a 24v LED driver, the lighting system achieves visually-complex effects whilst being extremely easy to manage. The ChromaFlood 100R and 200 have sadly retired from active duty and are no longer available, however our brighter and more efficient range of Luxeos units will give you everything you need. Find out more about the Luxeos range of LED light fixtures here. Since the project’s completion the exterior colour changing LED lights have been frequently changed to suit the atrium lighting to special occasions, seasons and time of day. 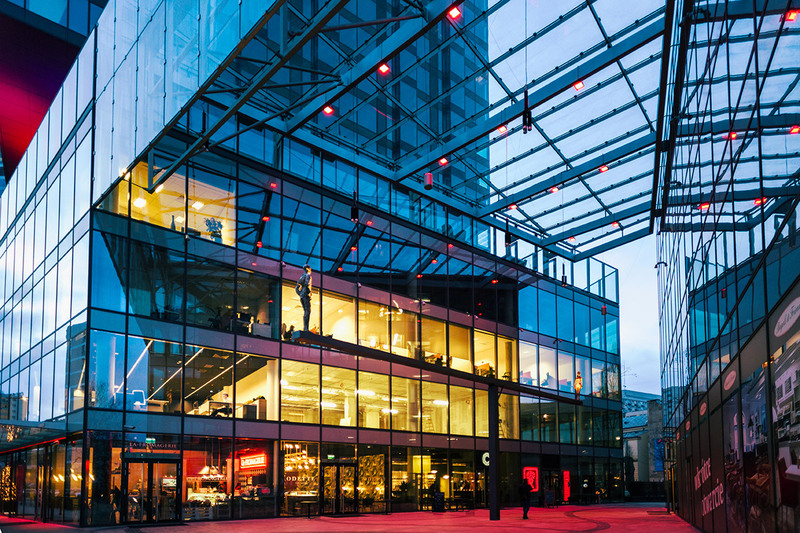 This is done with minimal client effort due to the reliability of Pulsar’s lighting products and the simplicity of our control solution, and has turned the building into a hub of the community. What’s more, the architect Helmut Jahn was thrilled with Pulsar’s restorative work to the 4th floor ceiling, saying: “The lighting of the red cantilever certainly reinforces the architectural feature of the Cosmopolitan and makes the building an icon.” This is not the first time that Pulsar’s work has helped make a structure iconic. Our varied projects include transforming UK-based Landshut Bridge’s lighting design and revamping the LED landscape lighting of Santa Monica, undoubtedly putting these landmarks on the map. Pulsar went above and beyond to fix an unsuitable lighting solution, delivering ceiling and exterior atrium lighting fixtures that the CEO could be proud of. 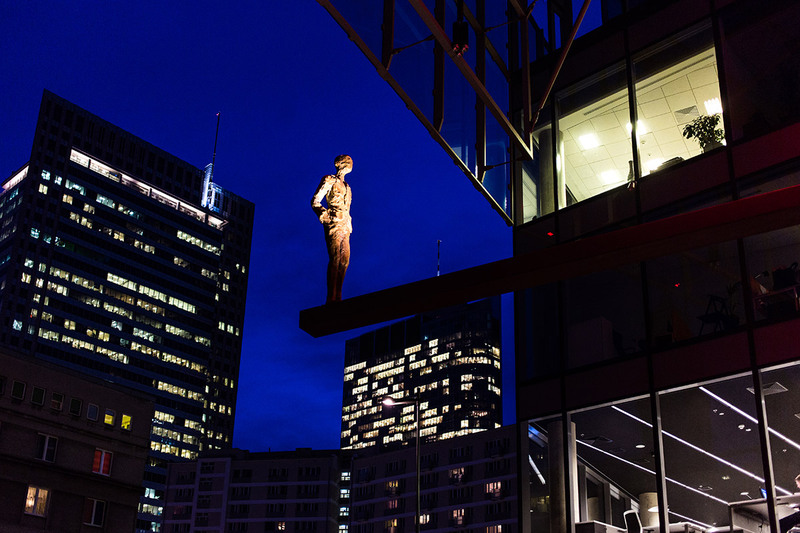 This reliable lighting installation will continue to illuminate the city of Warsaw with its real-time mood lighting for many years to come.